LockSolid are specialists for uPVC lift handles and door locks in Norwich and Norfolk. For a Norwich based uPVC Door Locksmiths specialist, contact LockSolid. We provide lock repairs, cylinder locks and lock mechanisms for all makes of uPVC lift handle doors. We stock ALL uPVC door locks, Euro cylinders and mechanisms for same day EMERGENCY repairs and installations. Furthermore, we promise the BEST prices in the Norwich and Norfolk area. LockSolid also specialise in double glazed uPVC multipoint door lock repairs, cylinders and mechanisms. All types of modern lift handles, lock plastic and composite door locks can be repaired and replaced. We also repair and replace both front and back door locks (Euro), uPVC French door locks and sliding patio doors. We are double glazing repair specialists covering the Norfolk and Norwich area. Our 24 hour emergency locksmith service for uPVC door lock problems includes lost keys, failed mechanisms, lock changes and lock upgrades to uPVC plastic and composite doors. We also provide ALL double glazing repairs, such as GU FERCO, FAB & FIX, MACO, FULLEX ERA, YALE LOCKMASTER, CEGO and many more! 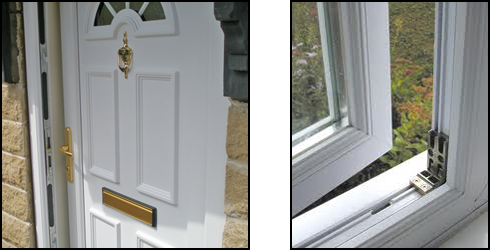 LockSolid Locksmiths are experienced in all modern uPVC double glazed door repairs. We can provide replacement door lock cylinders for key changes and mechanisms for a majority of uPVC doors. All locks are stocked in the van, allowing your double glazing repairs to be completed in one visit. The LockSolid shop is located in Norwich, near to the Norwich City Football Ground” rel=”noopener” target=”_blank”>Norwich City Football Club. Are you into DIY? Do you want to carry out your own double glazing repair? We have all the necessary parts available! The uPVC door is multi-point locking system where you lift the handle to lock. It comprises of hooks, bolts and rollers, and is found on a majority of domestic properties today. Generally, the parts required to carry out double glazing repairs are unavailable in local DIY stores. However, our trade counter stocks all parts to carry out double glazing repairs. A well known weakness in the uPVC cylinder locks are the most common way thieves are breaking in. Therefore, upgrading your existing cylinder and handles is a must. Fitting a three star cylinder and two star handles will give you the resistance needed to defeat cylinder attack. Full range of BS kite-marked, anti-snap cylinders available. Also selling handles from the MLA (Master Locksmiths Association) “Sold Secure” range. Double glazing repairs in Norwich. Window and door locks repaired or replaced. At LockSolid, we repair, replace and service double glazed window handles and hinges. Additional security fitted and advised on downstairs windows. Externally glazed uPVC double-glazed units with the internal gasket need securing. This can be done with security tape or a new system. We stock NO-GO window locks. Our ability to track down parts for older uPVC and aluminium doors has gained us an enviable reputation over the years. If we can’t source your part, we can retro-fit a newer part. Therefore, we repair and upgrade your door at the same time! If your locking system uses rollers to secure, our newer designed replacements will have hooks or bolts. This adds much more strength and security for your door. Ferco type roller locks are NOT secure. Therefore, replacements should NOT be fitted. A mechanism with deadbolts or hooks is needed to secure your door properly. LockSolid Locksmiths are double glazing repair specialists, highly rated for service and value. Upgrades are available at very competitive prices, keeping your home secure. We also offer FREE ESTIMATES & ADVICE. ALL types of windows and doors repaired and serviced by a Norwich based locksmith. Patio sliding doors (new or old) and ALL double glazing repair work undertaken and FULLY guaranteed. Fast and reliable service, plus FREE written estimates on request. ALL double glazing repair work undertaken in Norwich. Locked out or Lost keys?